Orchids are one of the most beautiful, exotic flowering plants. In the past, famous orchid growers such as Raymond Burr (Perry Mason) used to have to go to great lengths, distances and costs to get their hands on orchids. 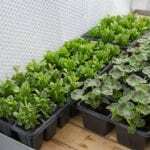 Now they are available in most garden centers, greenhouses and even big box stores, making orchid growing an easy, inexpensive hobby for anyone. However, even the most experienced of orchid growers can encounter problems – one being a sticky substance on orchid leaves. Read on to learn about common reasons for sticky orchid leaves. Many people who are new to growing orchids panic at the first sight of any sticky stuff on orchids. Avid gardeners know that sticky substances on plants are oftentimes the secretions, or ‘honeydew’ of insect pests, such as aphids, mealybugs or scale insects. Although these pests certainly can cause a sticky substance on orchid plants, there is a natural sap that is produced by some orchid flowers and buds. Orchid growers call this clear, sticky stuff “happy sap.” While this happy sap is produced by the flowers, probably to attract pollinators, it can drip a lot, causing sticky orchid leaves or stems. So, if orchid leaves are sticky, it could simply be attributed to this clear sap, which washes off the plant surfaces easily and is no cause for concern. When you see any sticky substance on orchids, it is best to thoroughly investigate all the plant surfaces for insects. 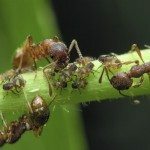 If you see ants running around on your orchids, it is a sign that there are aphids or mealybugs present, as they have a strange symbiotic relationship with these pests. Aphids, mealybugs and scale can go unnoticed under plant leaves, at leaf joints and even on the flowers and buds, so closely inspect every bit of the orchid plants. Honeydew is prone to sooty mold, which will form gray to brown sticky, slimy patches on orchid foliage. Sooty mold is a fungal infection that can cause significant damage if left untreated. Aphids, mealybugs and scale can also cause great damage and even death to infected orchid plants. If you suspect your orchids have any of these pests, thoroughly wash all the plant tissues with horticultural oil or rubbing alcohol. You can periodically use horticultural oil or neem oil to prevent future infestations. These oils can also prevent an array of fungal diseases. If your orchid has dark brown to black sticky, wet looking spots on the foliage and stems, this could be a sign of a serious bacterial infection. Infected plant tissues can be taken or sent to your local extension office for an exact diagnosis. However, there is no treatment for bacterial infections of orchids. The diseased plants should be removed and destroyed to prevent further infections. Some fungal diseases may also produce sticky brown to black rings on orchid foliage. In the case of fungal diseases, the infected foliage can be removed and horticultural oils can be used to prevent further infections.